I started Legal Nomads primarily as a travel blog for my family and friends. After saving money while working a lawyer for 5 years, I quit my job in 2008. My plan was to travel the world for a year and then return to the law. I figured it might be fun for people who knew me to come along for the ride online. It has been 9 years, and I have yet to return to the practice of law. This deviation was a bit of a fortunate accident, because I never intended Legal Nomads to become my job. But as time went on, the site’s popularity grew and the projects I worked on multiplied with the new audience. What started as nomadic living has morphed into a home base in Oaxaca, Mexico, with exciting work in food and storytelling. Unfortunately, due to a significant health crisis, the Legal Nomads blog is on hold indefinitely. Thank you for your understanding. Legal Nomads began as a vaguely chronological recounting of my time living and eating abroad. I wanted friends to follow along, and I loved to write. As a celiac who traveled, food was an important part of my days. I needed to know what to eat, and what to avoid so that I did not get sick. Through the lens of mealtimes, I was able to learn so much more about a place and its people. I also discovered a deep abiding love of soup. Legal Nomads evolved from a personal blog to a multi-focused platform for food, stories, and photography. Here, readers will find a community that connects storytellers who want to dig deep into a new country, in-depth food guides to cities around the world, and a long set of resources to help plan and budget for long term travel. From my end, I want the site to remain an inspiration to those who crave a life of travel and exploration, but one that also sets realistic expectations about the sacrifices unconventional choices require. Legal Nomads focuses on food, but also the human experience in a modern digital world. my best articles page, divided by topic. the travel resources page, which hopefully serves as a starting point for those feeling overwhelmed with travel planning. It has budget, packing, solo female travel, and many other sections to get you started. For those seeking to work and travel, my resources for location independent entrepreneur. It’s a long resources page with tips, tricks, visa suggestions, and more from people who have done it successfully. For celiacs, my landing page for detailed gluten free translation cards. These cards are different because they account for cross contamination, local food names, and were written by a food-obsessed celiac. They are accompanied by free GF travel guides. 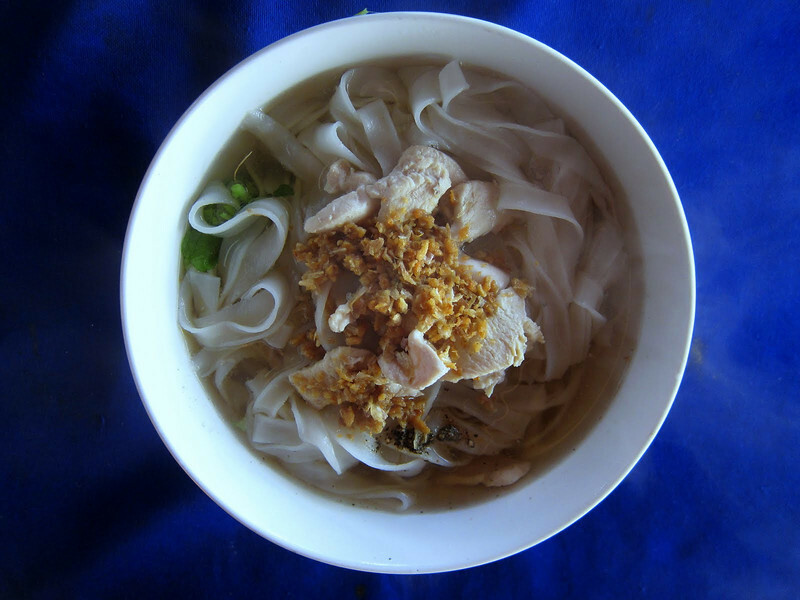 For fellow street food aficionados, my how to eat street food without getting sick provides tips and tricks for enjoying great, cheap food safely as you travel. And, because jet lag is a problem for us all: how to prevent jetlag when you travel. In recent years, Legal Nomads has won several Lowell Thomas Awards and North American Travel Journalism awards for writing and photography. It has been featured in the New York Times, National Geographic, The Guardian, Fast Company, BBC Travel, CNN, and more, as well as on the blogs and sites of many of my readers. For a full list, please see my press/pr page. In addition, the Links I Loved Newsletter, highlighting the best pieces from around the web in any given month, has been growing steadily as a curated digest of longform writing. More than anything, Legal Nomads is about a lifelong dedication to learning as much as possible and connecting to others through food. My travels evolved from living out of a backpack for several years, to now having a home base in Mexico and moving around for 4-6 months of the year. If you told me back in 1998, when I went to law school, that I would be running a food and travel business from around the world in 2017? I would have laughed at the impossibility. I thought I would be a lawyer in New York and eventually shift into a public advocacy legal role. Never did I think I would be a writer and public speaker. I grew up in Montreal, Quebec, and spend my childhood skiing and playing soccer and not really thinking about long-term travel or food. It wasn’t until I saw a documentary about Siberia in high school that I began to think about heading there myself, a seed that grew bit by bit as the years went by. Prior to founding Legal Nomads, I worked for 5 years in New York as a corporate lawyer, having studied in Canada and then accepted an offer at a firm in Manhattan. My school debt was minimal due to Canadian tuition rates, and as I practiced law I was also able to save up for my dream trip. I set out in 2008, with Siberia as the impetus for a sabbatical from the law. As I travelled, I found something new happening: I started to pick places because of the food. Learning about countries and their history became far more fascinating when seen through the lens of mealtimes, and I wrote about food more and more on the site starting in 2010. By 2012, when I published my first book, The Food Traveler’s Handbook about how to eat safely and cheaply around the world, food had eclipsed almost everything else as I roamed. I am also a celiac, and part of why I continue to share on Legal Nomads is to help others with the disease travel safely and with less fear. The Gluten Free Travel Guides aim to arm celiacs with more knowledge and less panic as they explore the world. I am honored that my writing has resonated with a growing community of readers. I’ve tried to share the good and the bad, the ups and the downs, and the stories that I learn along the way. Understandably, people want to know how to make an unconventional job work. No, I don’t have a trust fund. No, I don’t have a rich boyfriend. Yes, these are actual questions that I’ve received. My writing slowly grew from passion project to platform for a few different revenue streams, each built upon the foundation of this site. I am fortunate that this site began in 2008, before the travel blogging sphere was established and saturated. My readership grew considerably year by year, and eventually I was able to shift away from blogging and toward the projects below. 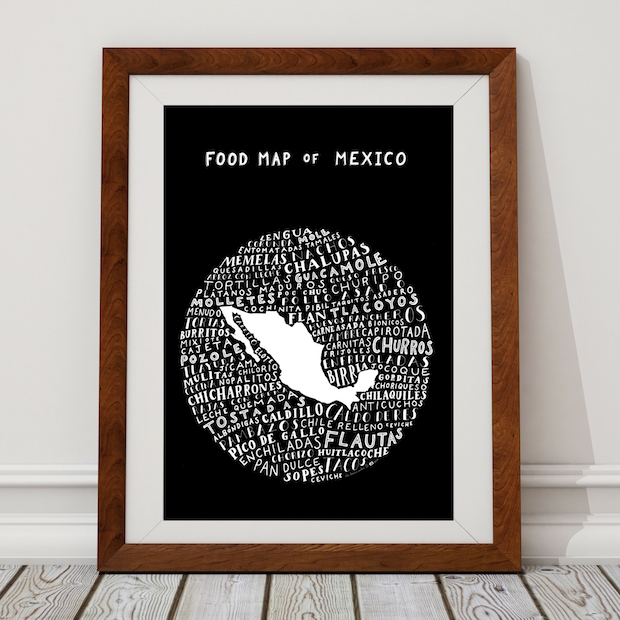 I am really proud of these beautiful hand-drawn maps of food that I designed. They were inked by the talented Ella F. Sanders, and are available in black and white. I’ve got posters (below! ), tote bags, and t-shirts. Presently, Italy, Vietnam, Portugal, Thailand and Mexico are in the store, with 10 countries planned. 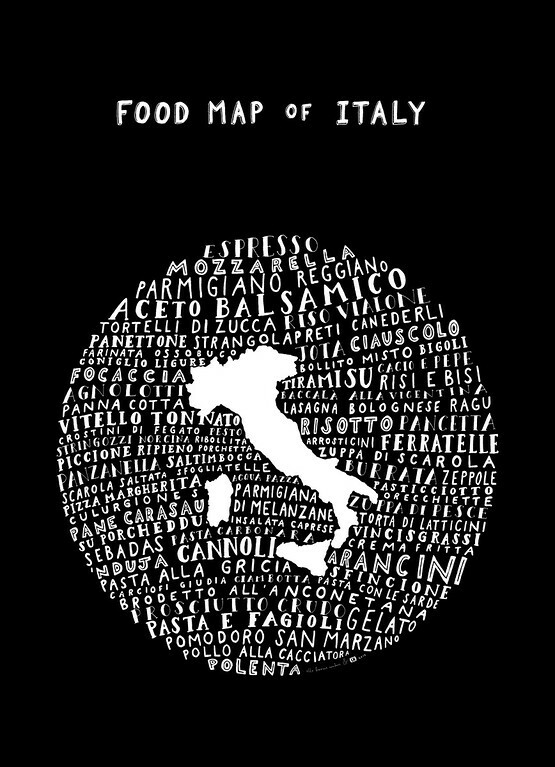 One of the countries in the Legal Nomads store: Italy food map! Gluten Free Restaurant Cards for Celiacs. I’ve bought and used existing gluten free restaurant cards while traveling, and still gotten sick. The reason? They don’t account for the names of local dishes, and cross-contamination issues. For celiacs, avoiding gluten isn’t a choice and consequences aren’t simply an upset stomach. I created these paid cards and accompanying free celiac guides in order to help others with the disease eat safely around the world. Occasional freelance writing for magazines and websites. I do not pitch stories in advance, but have licensed photography and written destination or food-based writing pieces for publications around the world, including The Guardian and the BBC. Speaking at conferences about food, storytelling, and branding in a crowded digital world. These are paid opportunities, and allow me to put these years of writing to work in a different medium. Please see my public speaking page for more information. Street food walks in Oaxaca, Mexico. I started feeding hungry readers in Saigon, upon their request. Part reader meetup, part eat-up, I took them around the city and introduced them to the wealth of great food. Now based in Oaxaca, readers have asked for the same. I offer 3-4 hour street food crawls to vendors I love in town. Yes, there is mezcal. Learn more here. I published my first book in 2012, called The Food Traveler’s Handbook. It’s about how to eat cheap, safe and delicious food anywhere in the world. And finally, still in the works: a storytelling course about how to to craft better narrative in a digital world. Part neuroscience of story, part nuts and bolts of how to write, the course will be four weeks long and limited to 10 people per ‘class’. You can learn more here. When the site began attracting more attention, I received offers for sponsored posts and text links, as well as ad offers. I decided to keep the site ad-free, and have maintained that throughout my years of travel. Book reviews: I sometimes summarize or list out books of interest to readers, particularly those about food or ones I read when I was travelling from A to B. Best books posts: Part 1, Part 2, and food books. I welcome emails about books you’ve written, especially if they are food-related. Occasionally publishers send me free books to read, which I include if I enjoy them and leave out if I do not. I also have a long post called A List of Books that May Change your Life, with input from readers. Product reviews: I do not cover products or review them. Instead, I post about what I actually travel with on my Travel Resources page. Amazon Affiliates: In posts where I reference books I’ve read or product I’ve used, I link to the product on Amazon.com or the manufacturer’s page, where I receive an affiliate percentage of the purchase price. If you click on a product I recommend and it is sold via Amazon or that manufacturer, I will receive a minimal percentage of the sale price (4%-6%, usually). I do not link to products I have not tested or verified. No sponsored posts, embedded links, or guest posts: I do not accept sponsored posts or embedded text links, nor do I take guest posts. The exceptions: longer term brand ambassadorships, such as the Wanderers in Residence programme with G Adventures, who I worked with previously, for 6 years. This includes work with Lonely Planet’s Pathfinders programme (which I’ve been a part of for over 2 years). I always disclose, and only work in long term partnerships with companies who provide value and help people travel effectively and sustainably. Ads generally: No no no. No ads, display or otherwise. No pop ups: I know, I know, they work. I hate them. So they won’t be on Legal Nomads. TL;DR Legal Nomads isn’t monetized via advertising or sponsored content, but rather through the creative projects and writing. The site is ad-free. Any affiliate links are products I have used or can vouch for and am comfortable attaching to my reputation online. I will continue to maintain this integrity and treat readers with respect, as I would want to be treated online. 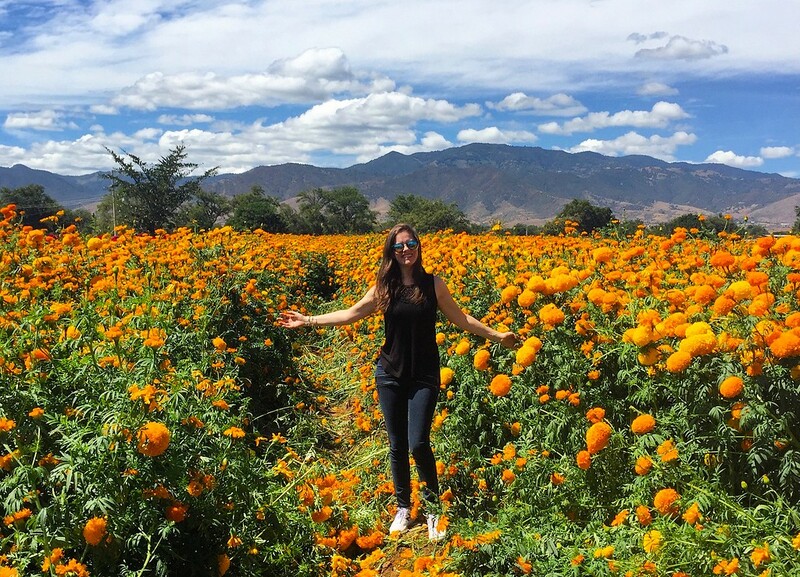 In a field of marigolds near Oaxaca, just before Day of the Dead. People often ask if my travels have been fulfilling, or if I regretted taking off. In my “why I quit” post I wrote about moments of overwhelming happiness on this journey. That’s not to say every day has been perfect, but on the whole I have been lucky enough to explore some extraordinary countries, meet terrific new friends and eat as much food as possible. On the ups and downs of having had no home base during the last many years of building Legal Nomads. 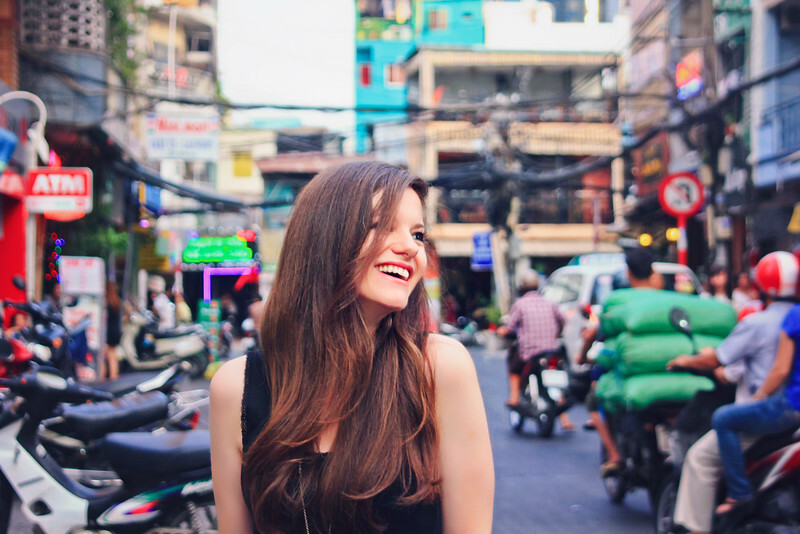 On how travel has helped me keep life in perspective in the long and short term. On homesickness and what it means to be ‘home’ in a world of in-betweens. On learning to cope with chronic pain. I’ve also put together a FAQ post for the questions I’ve received most from readers, and the rest of my personal stories are here. A video interview from July 2013 with Bloomberg TV for their “Stealth Lawyer” series, about food, travel and life after law. I’m on Twitter, Google Plus, and Facebook, as well as Instagram. You can sign up for my monthly newsletter, where I curate the best of longform writing from around the web, here.